Lawrence Weeks holds a baby floppy eared bunny in his hands. Weeks raises several different kinds of rabbits to sell to 4- H kids for rabbit shows. He also raises them for their meat. One of Weeks’ New Zealand rabbits sits in his rabbit barn. Despite the name, a New Zealand is of American origin. Weeks will always have a few rabbits, he said, but he is pretty discouraged after losing some of his bunnies recently. Rabbit meat isn’t on everyone’s table, but Weeks would rather eat rabbit than chicken or beef. As a Cuniculturist (one who breeds and raises domestic rabbits as livestock for meat or fur), he’s been raising and eating rabbits for over 70 years. He has also found a clientele that buys his dressed and cleaned bunnies. As he got older, he started to butcher them himself and sell them to Lott’s store, a grocer in Trenton. Today, those same rabbits will fetch $15 to $20, dressed and refrigerated. 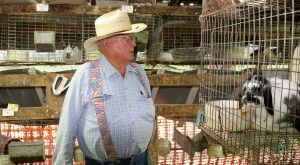 There is still a demand for the furry animal; he has customers as far away as Bear Lake and Rigby that call for ‘the other white meat.’ He has sold meat rabbits to people in Rexburg and Burley in Idaho; and, even people from Clarkston to Hyrum buy rabbit meat. Some people say they taste like chicken, but Weeks disagrees. He said rabbits are tastier than chicken. It all started for Weeks when a Utah State University extension agent introduced Weeks to rabbit husbandry, and that opened up a new world for the seven-year-old. The Extension agent took him to fairs around the county, enabling Weeks to start judging rabbits about the time he graduated from high school. One buck and two does will produce 180 pounds of meat. There are a lot people in urban areas that raise rabbits as food. They don’t need acres to roam, they are easy to care for, and all they need is water and food. Don’t misunderstand Weeks’ motives, he also raises rabbits for show and pets. 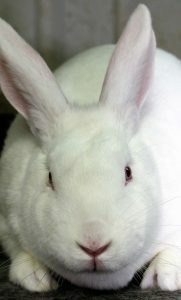 He is a member of the American Rabbit Breeders Association and produces rabbits for eating, showing, and pets. There are some big rabbit breeders in the country, but he feels like he’s still a hobby farmer when it comes to rabbits. He has about 160 rabbits now, down from the 350 rabbits he has previously had on hand. He said at his age, it’s time to slow down. Weeks sold off some of his inventory to other breeders trying to get into the business. Weeks feeds his rabbits a special blend of pellets made just for him by Cache Commodities, a commercial cattle feed operation that operates out of Ogden. “They are awesome people, they are good on the quality and they’ve taken care of me. They have been especially good to work with. He said he likes the New Zealand and the Californian breeds to raise for meat. Weeks also sells mini satins and mini lop for pets and to show. Although there is a market for rabbit fur, he hasn’t tapped into that part of the business. Weeks’ was a career electrician with USU. However, he invested a lifetime learning all he could about rabbits. And the cute little mammals have paid dividends for the Preston farmer. He said if farmers take care of them, they can be a good investment. But they’ve got to take care of them. Weeks has raised a lot of meat over the years and he thinks rabbits have the best meat. He said there is a market for rabbits around here. He’s sold meat rabbits to people in Rexburg, Rigby, Burley, even to people from Clarkston and Hyrum buy rabbit meat. What kind of neanderthal are you promoting? Rabbits are third in popularity as PETS in the United States. You should not be promoting this backward redneck old way of thinking of rabbits. Judging by his obesity he should consider a vegetarian diet! What a rediculous thing to say. You know nothing of this man. Why are you so full of hate. I’ll bet your so foul and unlikable because you never get to eat meat. Let people eat what they want. Stop hating people because they don’t happen to believe the same thing you do. To animal advocate: No one asked you. Go eat rocks. People have eaten meat for centuries, only recently have animals become pets. The dude is 77 and is allowed to have a belly, don’t be such a doofus. How can I contact Lawrence Weeks to purchase some rabbit meat? Can you help me with that please?